Purchasing a Trawler seems like a relatively simple acquisition. 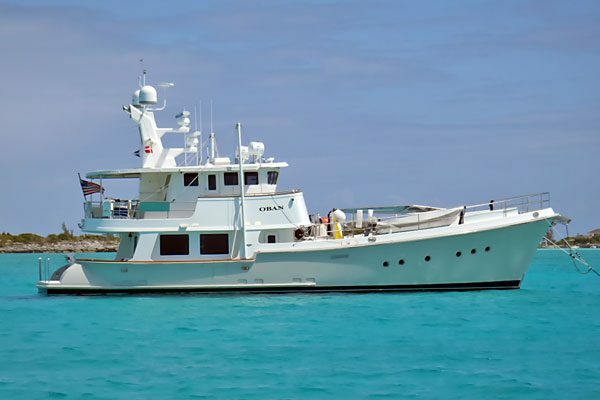 You find a brand and model you like that is suitable for the type of cruising you intend to do, look at the trawler, make an offer, get the trawler surveyed and then close the deal. It can be that simple, but the folks out their cruising on the same trawler year after year are enjoying their success because they planned their purchase. The happiest trawler owners do their homework before signing a check. It’s pretty easy to do your research and make sure the value is there for the price you pay. In order of magnitude the reality is that purchasing a trawler is probably one of the largest transactions you will ever conduct. It ranks right up there with buying a house or a motor home and that’s a pretty good comparison since you are, in essence, purchasing a waterfront home with bedrooms, bathrooms, living spaces, etc., that includes a driver’s seat with dashboard instrumentation and machinery spaces for the engine(s) and steering equipment. When you realize the reliability available with modern navigation and communication electronics, as well as the incredible dependability of diesel engines you can more fully appreciate the concept that relatively novice owner operators are safely and comfortably going out cruising on trawlers. The trawler lifestyle is not only more accessible than ever, it has become a mainstream pastime. Confident cruisers who possess a good blend of initiative and common sense are enjoying time out away from civilization with family and friends, seeing the coastlines and visiting harbors the best way you can – from the water. Take your time as you immerse yourself in this active and engaging pursuit. The more research you do the better you will understand your choices and ultimately it will all come together to help you make the most informed decision. Read as much as you can, talk to other boaters, get on trawlers at shows and start figuring out your budget and where you want to cruise. The right trawler at the right price is out there waiting for you, now you just need to go and find it!